Groin pain in athletes is a priority area for sports physiotherapy and sports medicine research. Heterogeneous studies with low methodological quality dominate research related to groin pain in athletes. Low-quality studies undermine the external validity of research findings and limit the ability to generalise findings to the target patient population. Minimum reporting standards for research on groin pain in athletes are overdue. We propose a set of minimum reporting standards based on best available evidence to be utilised in future research on groin pain in athletes. Minimum reporting standards are provided in relation to: (1) study methodology, (2) study participants and injury history, (3) clinical examination, (4) clinical assessment and (5) radiology. Adherence to these minimum reporting standards will strengthen the quality and transparency of research conducted on groin pain in athletes. This will allow an easier comparison of outcomes across studies in the future. Groin pain is common in athletes participating in multidirectional team sports. In a recent review, Orchard1 reported that ice hockey and football codes (other than soccer) involving twisting/turning and kicking have high rates of groin injuries. Additionally, Waldén, et al2 reported that groin injuries are common in senior soccer. Groin pain in athletes is a considerable challenge for clinicians owing to its high incidence and prevalence, association with significant time loss from sport and high recurrence rates. It is an important area for sports physiotherapy and sports medicine research. A recent systematic review on the treatment of groin pain in athletes identified 72 studies.3 Only four of the studies were high quality, and there was an inverse correlation between the reported outcome and the methodological quality score. Low methodological quality frequently resulted from a lack of basic information such as the absence of a suitable control group, failure to conceal allocation and failure to blind either study participants, assessors or those involved in the treatment. The review also highlighted the confusion surrounding the nomenclature of groin pain in athletes, as 33 different diagnostic terms were used in the 72 studies.3 Furthermore, inadequate reporting of participant characteristics, injury history and clinical examination findings was common. Heterogeneous taxonomy and confusion in the field motivated the “Doha agreement meeting on terminology and definitions in groin pain in athletes”;4 this consensus paper proposes a clinical classification system and uniform terminology for groin pain in athletes. The Doha agreement also identified the need to provide minimum methodological and clinical reporting standards for research on groin pain in athletes.4 This would improve the potential for data synthesis for systematic reviews and meta-analyses. In both research and clinical practice, MRI is increasingly being used for the assessment of groin pain in athletes. However, in a recent review, Branci et al5 concluded that the methodological quality of imaging studies remains low. Common methodological limitations include inconsistent diagnostic terminology, the regular inclusion of heterogeneous study populations and a lack of reliable assessment procedures. Considering the aforementioned fairly fundamental limitations, the aim of the present paper was to provide minimum reporting standards in five areas of research on groin pain in athletes. These specific areas include: (1) study methodology, (2) study participants and injury history, (3) clinical examination, (4) clinical assessment and (5) radiology. This paper was initiated by the primary author (ED), in conjunction with researchers (AW and PH) from the Sports Groin Pain Center, Aspetar Orthopaedic and Sports Medicine Hospital, Doha, Qatar. An additional three international experts (KT, KMK and PR) were invited to participate. The experts were selected for their expertise, according to the interpretation of the initiating researchers, and they did not represent specific organisations. The primary author was previously involved in the development of a consensus statement related to chronic ankle instability (CAI),6–8 and thus had experience in developing guidelines relating to minimum reporting standards. 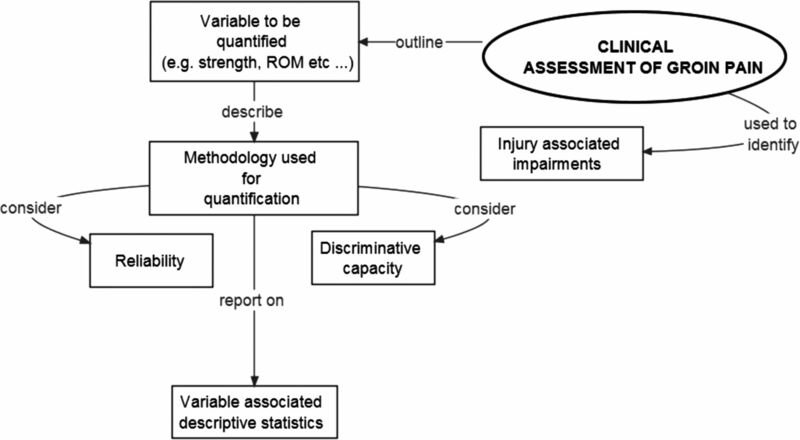 The key items for inclusion in the present paper were based on the collective expertise of the group along with analysis of key methodological shortcomings of published research in the area identified by recent systematic reviews.3 ,5 Collectively, the group agreed that minimum reporting standards could be improved in relation to: (1) study methodology, (2) study participants and injury history, (3) clinical examination, (4) clinical assessment and (5) radiology. The credibility of research is dependent on the ability of end users to critically assess the study design, conduct and analysis. Therefore, for future research on groin pain in athletes, we recommend using established published guidelines to improve study methodological design and reporting (table 1). The evaluation of interventions is of primary importance to clinicians and researchers alike. Without a transparent and comprehensive published description of an intervention, the utility of the intervention may be compromised. As such, for those research studies investigating the efficacy of a specific intervention, we endorse compliance with the Template for Intervention Description and Replication (TIDieR) checklist and guide.16 With reference to RCTs, the TIDieR checklist and guide should be used concomitantly with the CONSORT checklist. Furthermore, for observational studies, the TIDieR checklist and guide should be used to supplement the STROBE statement. 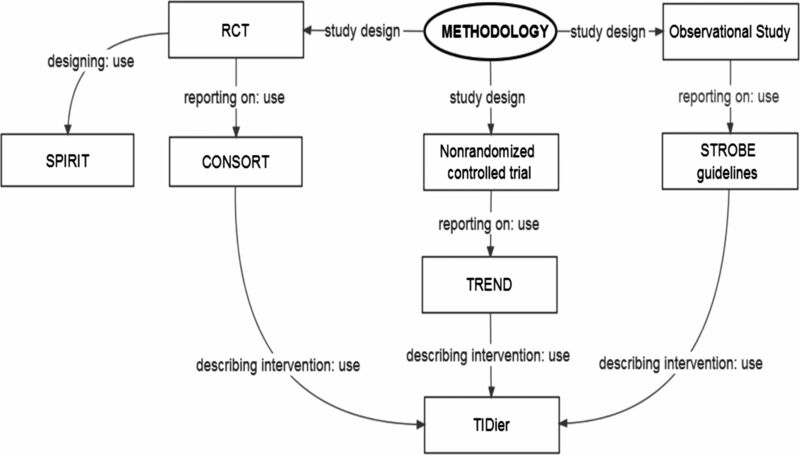 Key methodological considerations for the design and reporting of studies are outlined in figure 1. Considerations for the design and reporting of studies on groin pain in athletes. CONSORT, Consolidated Standards of Reporting Trials; RCT, randomised controlled trial; STROBE, Strengthening the Reporting of Observational Studies in Epidemiology; SPIRIT, Standard Protocol Items: Recommendations for Intervention Trials; TIDieR, Template for Intervention Description and Replication; TREND, Transparent Reporting of Evaluations with Non-randomised Designs. Key considerations for reporting on study participants and injury history are outlined in figure 2. Considerations for the reporting on participants and injury history in studies on groin pain in athletes. Clinical examination findings in study participants should be thoroughly described. Researchers should try to use clinical examination methodologies that are standardised and reliable. Additionally, when choosing clinical examination methodologies, researchers should also consider their discriminative capacity. At a minimum, we recommend that researchers comprehensively describe the clinical examination methodologies used, and associated diagnostic criteria, so that others can reproduce them. Key considerations for reporting on clinical examination are outlined in figure 3. Considerations for the reporting on clinical examination in studies on groin pain in athletes. The “Doha agreement meeting on terminology and definitions in groin pain in athletes” reports a clinical classification system for athletes with groin pain.4 The system has three major subheadings: (1) defined clinical entities for groin pain in athletes (adductor-related, iliopsoas-related, inguinal-related, pubic-related); (2) hip-related groin pain in athletes and (3) other causes of groin pain in athletes. Clinical examination reporting standards relative to (1) and (2) above are discussed below. Adductor-related groin pain is defined by tenderness on palpation of the adductors as well as pain on resisted hip adduction. Tenderness is defined as discomfort or pain when the area is palpated and whereby the athlete recognises this to be associated with their specific injury pain. The pain on resisted adduction testing should reproduce the athlete's recognisable pain in the adductors. As tenderness on palpation and pain on resistance testing are essential for diagnosing this entity, we recommended that during clinical examination the following are noted and subsequently reported: (1) presence of tenderness on palpation of the adductors and (2) presence of pain on resisted hip adduction. Proposed methodologies to improve clinical assessment outcome measure reporting relative to adductor-related groin pain are outlined in the Minimum reporting standards on clinical assessment section. Iliopsoas-related groin pain is characterised by tenderness on iliopsoas palpation. As tenderness on palpation is essential for diagnosing this entity, we recommended that, as a minimum, the presence of tenderness on palpation of the iliopsoas muscle is reported. This clinical entity is more likely to be present if the athlete's pain is provoked by resisted hip flexion testing and/or stretching of the iliopsoas muscle. The pain on resisted hip flexion testing and/or stretching should reproduce the athlete's recognisable pain. As pain on resisted hip flexion and/or stretching of the iliopsoas is often present in athletes with iliopsoas-related groin pain, researchers should also consider quantifying and reporting the following: (1) presence or absence of the athlete's recognisable pain on resisted hip flexion and (2) presence or absence of the athlete's recognisable pain on stretching of the iliopsoas muscle. Proposed methodologies to improve clinical assessment outcome measure reporting relative to iliopsoas-related groin pain are outlined in the Minimum reporting standards on clinical assessment section. Inguinal-related groin pain is defined as the presence of pain in the inguinal canal region and tenderness of the inguinal canal. As tenderness on palpation of the inguinal canal is essential for diagnosing this entity, we recommended that, as a minimum, the presence of tenderness on palpation of the inguinal canal is documented and reported. This clinical entity is more likely to be present if the athlete's pain is aggravated by resistance testing of the abdominal muscles or on Valsalva/cough/sneeze; hence, researchers should also consider reporting the following: (1) presence or absence of the athlete's recognisable pain on resistance testing of the abdominals and (2) presence or absence of the athlete's recognisable pain on Valsalva/cough/sneeze. Pubic-related groin pain is defined by localised tenderness over the pubic symphysis and immediate adjacent bone. The tenderness on palpation should reproduce the athlete's reported pain. We recommend that authors note and report the presence of tenderness on palpation immediately over the pubic symphysis and/or adjacent bone. Single clinical tests characteristic of hip-related groin pain are difficult to recommend as most tests have been shown to have better sensitivity than specificity.18 ,19 This means that the tests are more suitable to ruling out hip-related groin pain than identifying the hip as a primary source of pain. However, we advise that during clinical examination, researchers should consider noting and reporting: (1) presence or absence of the athlete's recognisable pain on the Flexion-Adduction-Internal Rotation (FADDIR) test and (2) presence or absence of the athlete's recognisable pain on the Flexion-Abduction-External Rotation (FABER) test. Proposed methodologies to improve clinical assessment outcome measure reporting relative to hip-related groin pain are outlined in the Minimum reporting standards on clinical assessment section. Athletes with groin pain are often characterised by impairments as well as activity limitations and participation restrictions. These can be objectively quantified during clinical assessment.20 The objective quantification and reporting of these factors allows for a more comprehensive description of the characteristic and clinical features of groin pain in athletes. At a minimum, we recommend that researchers comprehensively describe the clinical assessment variable to be quantified, the methodology used to quantify the variable and the variable-associated descriptive statistics. Key considerations for the reporting on clinical assessment are outlined in figure 4. Considerations for the reporting on clinical assessment in studies on groin pain in athletes. ROM, range of motion. In a recent systematic review by Mosler et al,20 quantification of three main factors was identified from the sports-related groin pain literature including hip muscle strength, hip range of motion, and self-reported hip and groin symptoms, in the form of patient-reported outcome measures (PROMs). Table 2 proposes some published methodologies that can aid researchers to more thoroughly describe important clinical assessment findings in athletes with groin pain. PROMs improve the quality of assessing and reporting the outcome of treatments. Assessment of self-reported hip and groin disability can be undertaken by using specific PROMs. In a recent systematic review on the clinimetric properties of PROMs for young physically active individuals with hip and/or groin pain, only one instrument, the Copenhagen HAGOS, existed for the assessment of individuals specifically reporting groin pain.32 The systematic review also showed that three other PROMs (Hip Outcome Score (HOS), International Hip Outcome Tool-12 (iHOT-12) and iHOT-33) existed, with all having sufficient clinimetric properties, including reliability, validity and responsiveness, to be recommended for use in individuals with hip-related pain. While HAGOS and HOS are profiles including several measurement scales measuring different aspects of impairment, activity and participation, iHOT-12 and iHOT-33 are composite scores with all domains contributing to one total score. We recommend that researchers carefully consider which aspects of impairment, activity limitations and participation restriction they want to assess in their study, as this has implications for choosing the most relevant primary outcome or aspect to be measured in the individual study. Therefore, scrutinising the content and measurement aspects in the different PROMs will aid researchers when applying a relevant measurement instrument, thus increasing their chances of quantifying the aspect of relevance and interest. Of all imaging modalities, MRI has been investigated most often. The majority of studies have focused on its use for pubic and adductor-related groin pain.5 There are very few studies examining the use of MRI in iliopsoas or inguinal related groin pain in athletes. Branci et al34 developed a standardised MRI evaluation protocol (Copenhagen Standardized MRI protocol) for use in athletes with groin pain. The standardised MRI protocol consists of 11 predefined imaging characteristics indicative of abnormalities commonly reported in athletes with groin pain. This protocol does not assess the iliopsoas or inguinal region. Fair-to-moderate intraobserver reliability was observed for all predefined imaging characteristics with the exception of adductor tendons. This means that, at present, we are not aware of any published well-defined and reliable way of assessing the iliopsoas, inguinal region or adductor muscles using MRI. The Copenhagen Standardized MRI protocol34 represents a starting point from which to develop a more uniform and scientific evaluation of imaging characteristics in athletes with groin pain. The adoption of the imaging techniques and terminology in this protocol will allow clinicians to compare their radiological findings in athletes with groin pain, which until now has not been possible. Further research will need to be performed to develop reliable MRI sequences and assessment techniques for the adductor, iliopsoas and inguinal regions. 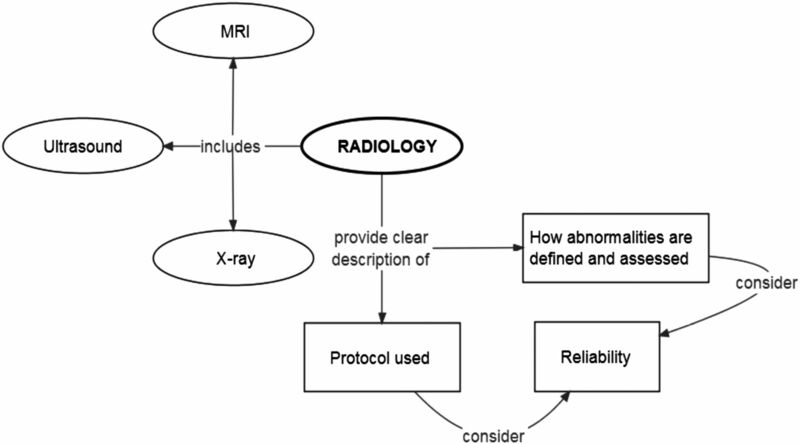 When reporting on MRI in research studies, a clear description of the protocol used, how abnormalities assessed for were defined and recorded, and an assessment of the reliability of the assessment, would add quality to future papers. The use of X-rays, CT and ultrasound is not as universally well studied or established in the literature as MRI, for evaluating athletes with groin pain. While ultrasound is commonly used in clinical practice, it is under-represented in the literature. Ultrasound is well established as an accurate technique for detecting and characterising inguinal and femoral hernias,35–37 but these pathologies are not typically present clinically or radiologically in athletes with groin pain.5 Studies on ultrasound in athletes with groin pain are infrequent and the quality of those performed to date is low; therefore, it is currently difficult to recommend a minimum protocol and reporting standard for this technique.38 We encourage those reporting on ultrasound in future studies to give a clear description of the protocol used, with adequate details to allow others to reproduce the examination. The definitions of how various abnormalities are judged to be present should be clear and, again, allow for reproduction by others. The reliability and repeatability of new protocols should be examined to ensure their clinical utility. While X-ray is frequently used in clinical practice to ‘exclude bony abnormalities’, most authors who have examined the role of X-ray have found bony abnormalities to be frequent.5 ,39 ,40 The clinical significance of many of these findings is unknown. As is the case for MRI and ultrasound studies, describing the way findings are defined and recorded, along with the reliability of the assessment, needs to be undertaken to investigate the clinical meaning of the abnormalities commonly found on X-ray. In summary, there are few resources available to help guide minimal reporting standards with regard to imaging. The Copenhagen Standardized MRI protocol34 provides a detailed description of the protocols used, gives a clearly defined assessment of abnormalities, and has fair-to-moderate reliability for the majority of findings. At the present time, we are not aware of detailed descriptions of reliable techniques for any imaging modality to assess for abnormalities of the adductors, iliopsoas or inguinal region (with the exception of hernias). Future studies should aim to develop these techniques, so that the clinical relevance of the abnormalities commonly found on imaging can be examined. Key considerations for the reporting on radiology are outlined in figure 5. Considerations for the reporting on radiology in studies on groin pain in athletes. Consensus statements in sports medicine and sports physiotherapy are needed relative to study type, sport and injury under investigation. In this paper, we propose minimum reporting standards to outline important criteria that should be considered to include when undertaking and disseminating research on groin pain in athletes. Poor design and reporting of studies undermines their clinical usefulness, and recent reviews illustrate the predominance of heterogeneous low-quality studies on groin pain in athletes.3 ,5 As such, it is clear that current peer-review processes are failing in this respect. Therefore, we feel that these recommendations regarding minimum reporting standards are justified and useful. It is apparent from the groin pain literature that minimum reporting standards on study methodology, study participants and injury history, clinical examination, clinical assessment and radiology are all necessary. Our outlined minimum reporting standards on study participants and injury history will facilitate a comprehensive description of participants enrolled in research studies. Clearly defined information on study participants and their injury history will enable readers to interpret the applicability and relevance of research findings to their clinical practice. Our recommended minimum reporting standards on clinical examination are aligned with the “Doha agreement meeting on terminology and definitions in groin pain in athletes”.4 Additionally, for clinical assessment of athletes with groin pain, we provide guidance on variables to be quantified, methodologies for quantifying these variables and associated appropriate outcome measures. Such guidance may allow for a more objective structured clinical examination, with appropriate reporting of quantifiable meaningful outcome measures. The high prevalence and incidence of groin pain in athletes supports the necessity for continued methodologically rigorous research on prevention and treatment. Based on collective expertise, and the best available evidence, we encourage the use of these minimum reporting standards in future research. In the coming years, it will be necessary to assess whether authors of research on groin pain in athletes adopt and implement our recommendations; and whether there is a concomitant improvement in study methodological quality and specific reporting on clinical examination, clinical assessment and radiology. Heterogeneous studies with low methodological quality dominate research related to groin pain in athletes. We propose a set of minimum reporting standards based on best available evidence to be utilised in future research on groin pain in athletes. Minimum reporting standards are provided in relation to: (1) study methodology, (2) study participants and injury history, (3) clinical examination, (4) clinical assessment and (5) radiology.
. Men at higher risk of groin injuries in elite team sports: a systematic review. Br J Sports Med 2015;49:798–802.
. The epidemiology of groin injury in senior football: a systematic review of prospective studies. 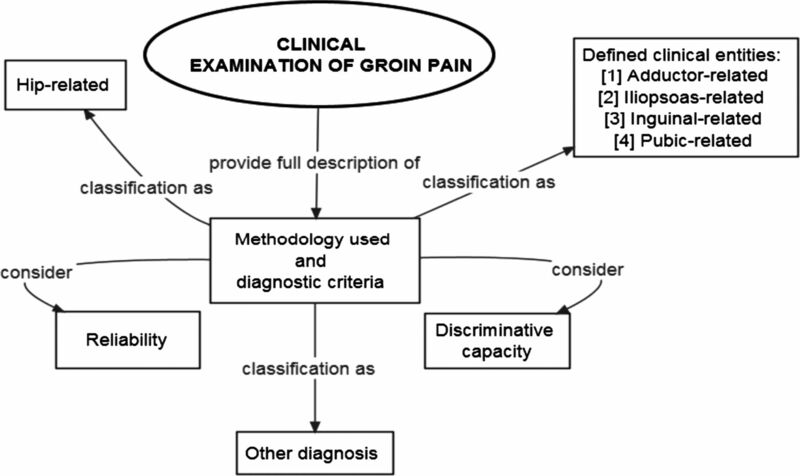 Br J Sports Med 2015;49: 792–7.
. Doha agreement meeting on terminology and definitions in groin pain in athletes. Br J Sports Med 2015;49:768–74.
. Clinical examination and physical assessment of hip joint-related pain in athletes. Int J Sports Phys Ther 2014;9:737–55.
. Factors differentiating athletes with and without hip and groin pain—a systematic review and meta-analysis. Br J Sports Med 2015;49:810.
. Patient-Reported Outcome (PRO) questionnaires for young to middle-aged adults with hip and groin disability: a systematic review of the clinimetric evidence. Br J Sports Med 2015;49:812doi:10.1136/bjsports-2014–094224.
. MRI findings in soccer players with long-standing adductor-related groin pain and asymptomatic controls. Br J Sports Med 2015;49:681–91doi:10.1136/bjsports-2014-094239.
. Dynamic inguinal ultrasound: a diagnostic tool for hernia surgeons. Hernia 2015. Published Online First.
. Evaluation of the usage and influence of groin ultrasound in primary and secondary healthcare settings. Hernia 2014. Published Online First. Contributors ED, PH, KMK, KT and AW developed the idea for the manuscript. All authors contributed to the writing, revision and final approval of the manuscript.